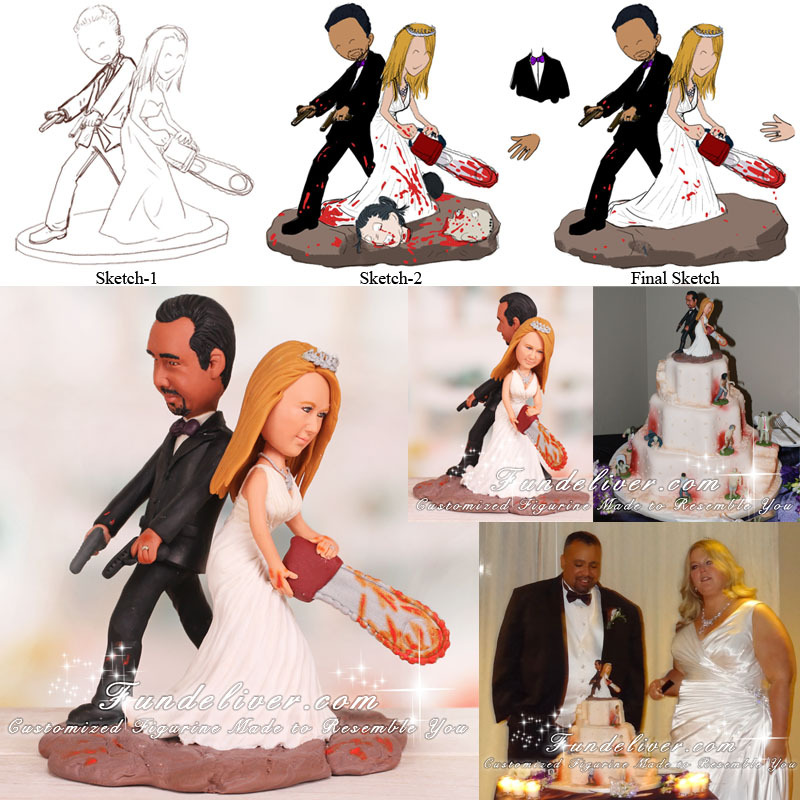 This is a completely customized groom holding pistols bride wielding chainsaw zombie attack theme wedding cake topper ordered by one of our customers. Their wedding cake has zombies climbing the tiered cake and they would like to have the bride and groom figurine standing back to back, the groom holding two pistols turned sideways shooting downward and the bride wielding a chainsaw to fight with zombies. 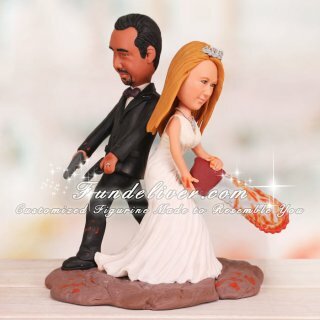 The bride figurine is wearing a small sparkly tiara on her head and a white V shaped neck line dress with one inch straps, an oblong sparkly decal on the left hip. The groom figurine is wearing a black tuxedo with a bow tie in a plum color. Also they would like to add smaller drops and hints of blood sprays on groom’s legs and pistols, bride’s chainsaw and base to accent the touch of zombie attack. In our second sketch, we even added some cut off heads of zombies, but our client prefers to remove them since they are too much for a wedding cake topper. Thanks Melissa and Chris for sharing their image and idea for this zombie wedding cake topper. Want to protect your love from zombie apocalypse? This zombie cake topper will be a perfect match. Just send us your ideas and reference images, we will first design some sketches to get your approval and then turn them into 3D figurines.